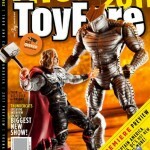 The Destroyer figure from the Thor Movie line has been revealed on the cover of ToyFare #162! 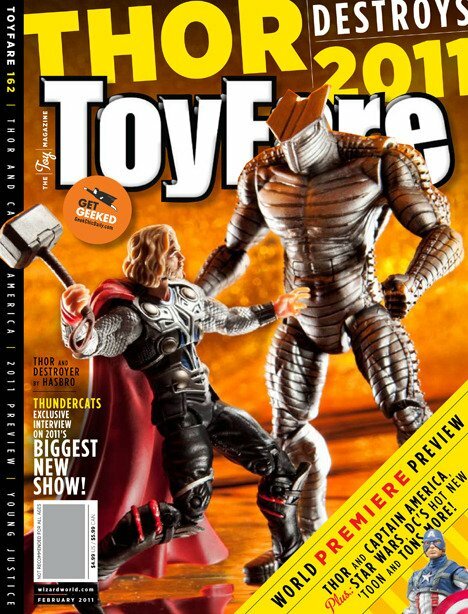 The figure is significantly larger than Thor. Be on the lookout for the new issue, which should be at comic shops today! Discuss on the Toyark Forums› Views: 4584 › Credit: XForce609 of the Toyark Forums! will go great with the MU Line! My God. That is epic. Much like the Cap int he corner. AND THE REVEALED REBEL FLEET TROOPER FOR THE VINTAGE COLLECTION ZOMG!!!!!!!!!!!!!!!!!!!!!!!111111ONE!!!!!!11! How can one even tell if he is missing those points? I'm just glad it is very close to the comic version. Gah, I think you're right... Well shoot. My guess is we'll get more than one though, so maybe I'll hold off on the trigger at first. I mean its just my hypothesis.. If you look at the picture I attached, I circled the bicep swivel articulation point and the wrist articulation point as well as the "Square" on his chest. Because his armor is all layered and what not, its harder to see the break between the shoulder and the arm, but I'm pretty sure it isn't there. It's probably just a light up feature, he does seem to have key articulation spots. I wonder if he'll be at the same price point. Glad to see the comic resemblance too. He's got ball hips, double knees, and ankles which are standard Hasbro points. I don't see them skimping on upper body POA too much. The square is probably for a light-up head feature. It probably means not waist or torso articulation. However, there's no way to tell on articulation. He definitely has at least hinged elbows, although they're likely typical Hasbro ball joints. And I'm guessing wrists as well. Look at how his left hand is angled in comparison to the upper arm. Seems like a slight rotation to the hand. Very cool. I don't even mind a few less points of articulation if the figure looks that good. Looks really good, but I'll wait until we get better pics, or a review before I add him to my must-buy list.